The LaRiviere Riders, Inc. Saddle Club was formed to preserve and enhance the LaRiviere Horse Park in Prairie du Chien, Wisconsin. 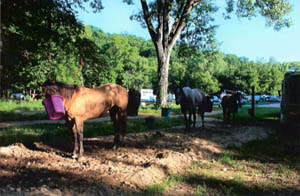 The Riders Club leases the LaRiviere Horse Park from the City of Prairie du Chien for horse camping and trail riding. Volunteered time and donated funds are used strictly to manage and maintain the park and adjoining trails. Many of the trails are through private property which we are generously permitted to ride on. It’s important that everyone be courteous of the land owner’s rights. Our mission is to increase public awareness and promote the presence and availability of the LaRiviere Horse Park for future generations, offer quality riding areas, the opportunity to observe nature, and emphasize on affordable and safe family oriented horse related activities and camping. Members strive to conserve the natural resources and enhance the environment by improving good trail maintenance techniques. 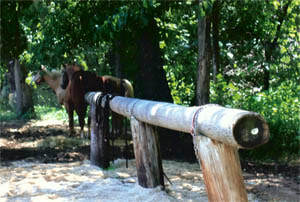 One member attended a Horse Council sponsored trail improvement class and is certified in trail improvement and maintenance. He generously shares his knowledge to target areas that challenge the impact of high trail use, maximizing the benefits of the experienced talents of volunteers. We attempt to minimize the adverse impacts on the agricultural and recreational properties used for the horse trails within and around the Park area. Improvements have been made and will continue to be made to the park by sharing the knowledge of the members. See the Membership tab to become a member of the LaRiviere Riders, Inc. 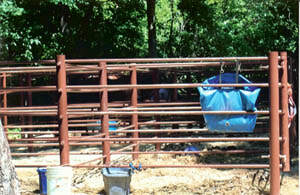 Membership is $10 per family per year (one mailing per address). Your continued support is welcomed and needed to maintain this wonderful place to ride. ​The riders experience the many wonders of nature as the trails take them through the woods to open fields and many hills and valleys. Some trails are not marked, and several can be rather challenging to the inexperienced rider. Trail signage and maps are in the works. We strive to provide an affordable opportunity for families with horses to share their experiences. 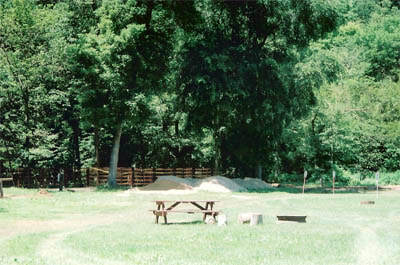 Through the generous donations of horse campers, various grants that become available, and volunteers, the LaRiviere Riders, Inc. has been able to maintain and improve the horse park. The park opens sometime in April, weather depending, and closes the 2nd weekend in November. Some private property trails are closed periodically for hunting. Notices will be posted and signs will be out to indicate which trails are closed for the season. We ask that closed trail signs be acknowledged, they are closed for a reason. ​The club officers and board of directors meet monthly to discuss issues that arise. Projects for improvements are decided by the Officers & Board of Directors as funding and grants become available. Specific improvements and concerns are always welcome to be presented to the Board for review, however, some improvements and changes do require approval of the City Park Board. Prairie du Chien is a short drive from the Park and offers a variety of amenities, include shopping, fine dining, fast foods, grocery stores , gambling casino, movie theater, bowling alley, hospital, sporting goods, and historical attractions, just to mention a few. many dining options, grocery stores, etc.